Pastor Graham walks you through Scriptures that will help strengthen your prayer life…and provides direction each day on a specific aspect of prayer. There is room to jot down your thoughts and prayer items for each day so you can go back and see just how God has answered your prayers. 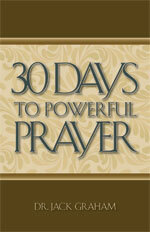 Experience God’s purpose, presence, and power as you learn to pray with the eyes of your heart.